Imagine your life in paradise – where golf carts are more practical than cars, friendly smiles are abundant, and the toughest decisions are how to spend all of your free time. Once you step inside our gated community tucked away in a natural harbour, you’re on island time, where life happens in the moment and on your terms. Life in Schooner Bay revolves around our beautiful Harbour Village, located on a small island in the center of the harbour. Once you step outside your home, you’re only a short walk away from our marina, the prestigious Blackfly Lodge, and the social center of the village – Sandpiper Inn. You’ll find that our friendly, laid back village is unlike any other neighborhood you’ve ever lived in. A day of island-hopping, deep-sea fishing, and other adventures at sea starts here. Our marina is the only harbour of refuge along the southern coastline of Great Abaco and is fully-equipped for fuel, long-term storage, and other provisions for any vessel up to 80 feet in length. Living in the boating capital of the world wouldn’t be complete without easy access to a first-class marina like ours in Schooner Bay. After a day of adventure, you’ll want a place to cool off and refresh. Next to our Beach Cabana bar and grill, we’re building an oasis for residents to relax and unwind. 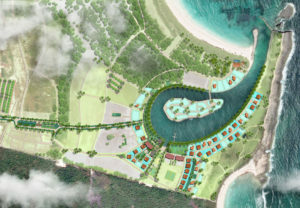 The Beach Club will include a pool, beachfront bar, restaurant, and lounge with quick access to water activities such as paddle boarding, kayaking, and snorkeling. Leave your stress and worries behind while you live on island time. At Schooner Bay, the food is fresh, the air is clean, and we’ve got enough outdoor activities to fuel your sense of adventure for a lifetime. We believe that a healthy life is a happy life, and living in our community makes it easy to have both. As our village of forward-thinking residents continues to grow, our vision for the Schooner Bay community will blossom. The Town Center will be a one-of-a-kind community gathering place for you and your guests. Amenities will include a reception center, restaurant, fitness center, kids play area, small pool for adults and kids, and an event lawn.